Click here to join the Island Net to stay informed of Island EP activities. Click here to learn about the data base we are setting up to help neighbors to help their neighbors and the Island. Click here to view the Nixle web page and subscribe to receive alerts. Governor Gregoire has declared April as Washington Disaster Preparedness Month. The focus for this month is earthquake preparedness. 11/8/11 - Click here to view a short (1m) video about the new FEMA website. Get FEMA App for your Smart phone. Search your App Markt for "FEMA". One is just called "FEMA" and contains a section called "Are you prepared?" with a sub-section of "What to do before, during and after disasters", "Emergency kit list", and "Meeting locations". The second is called "FEMA Are You Ready?" and is a PDF doc with lots of information. 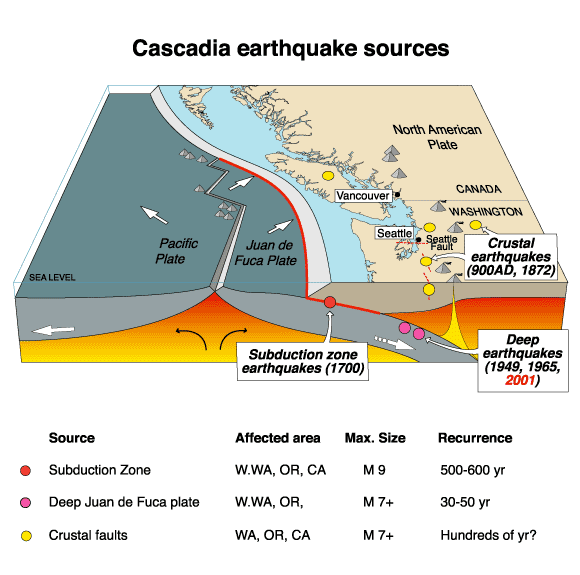 This PDN article that says "... Scientists (have) revised their estimates about the Cascadia Subduction Zone, where the Juan de Fuca and North America tectonic plates collide in an area off the coast between Vancouver Island and Northern California. ... New studies indicate the subduction zone is more likely to experience one great 9.0 quake that will completely rupture the fault, ... "
Some links from Rita Kepner that I will place above when I have time to review them. Opinion article "Excuse Me, but Catastrophe Looms"
8/17/2011 - Opinion article "Excuse Me, but Catastrophe Looms"
A few years back we had a small earthquake that was epicentered in the middle of Kilisut Harbor – did you know that? You can track local earthquakes even the ones too small to feel – put these sites on your favorites list. http://earthquakescanada.nrcan.gc.ca/index-eng.php?tpl_region=west -- sometimes the Canadians post things our USGS does not. This is a really good Canadian site that includes our area. KROH is now on the air. The station is equipped to broadcast emergency alerts received from all levels of government.. In the near future with the installation of additional equipment, KROH and KPTZ will both have the capability of broadcasting two way conversations between the studios and Emergency Operations Center in Port Hadlock.